The world has an array of amazing buildings that showcase the cultural architecture of each country. From ancient buildings scattered about in Italy, to the technologically advanced buildings in China, each building and structure has a unique history from it’s origin. Humans have been making amazing, sturdy structures since ancient times that have withstood weathering, the elements, and passing time such as the pyramids of Giza, or the buildings of Pompeii. No matter what feats that humans have had to overcome throughout history, our architecture seems to improve more and more. The following is a list of a few of the coolest buildings currently standing in the world. Deemed a UNESCO World Heritage Site in 1983, the Taj Mahal is a beautiful marble mausoleum located in Agra, Uttar Prasdesh, India. Considered one of the best examples of Mughal architecture, the Taj Mahal has a rich history, which was built starting in 1632. Built by Mughal emperor Shah Juhan, in memory of his wife Mumtaz Muhal, the Taj Mahal was not completed until 1653. 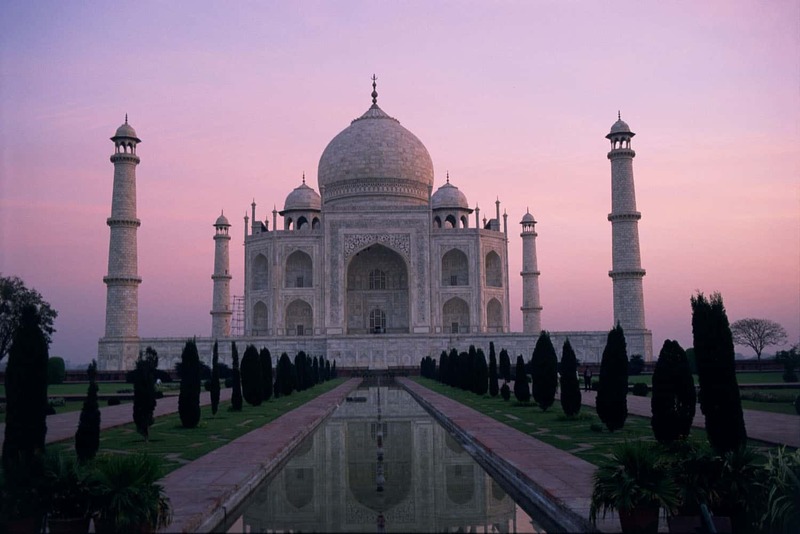 Thousands of artisans and craftsmen were involved in the construction of the Taj Mahal, with beautiful art and structures inside, capturing the Persian, Turkish, Indian, and Islamic cultures in a beautiful way. There are several gardens, including the magnificent Moonlight Gardens, as well as a mosque and a bazaar on site of the Taj Mahal. The Taj Mahal has a tomb which is the central focus of the structure, that contain Mumtaz Muhal and Shah Juhan in the lower levels. Located in the largest city in Mexico, Monterrey, the Niños Conarte library is a beautiful geometric structure inside meant to depict the surrounding geography of the area. The Conarte is the Council for the Culture and Arts of Nuevo Leon, with a plethora of museums, gardens, convention centers, themeparks, and auditoriums surrounding the Conarte. 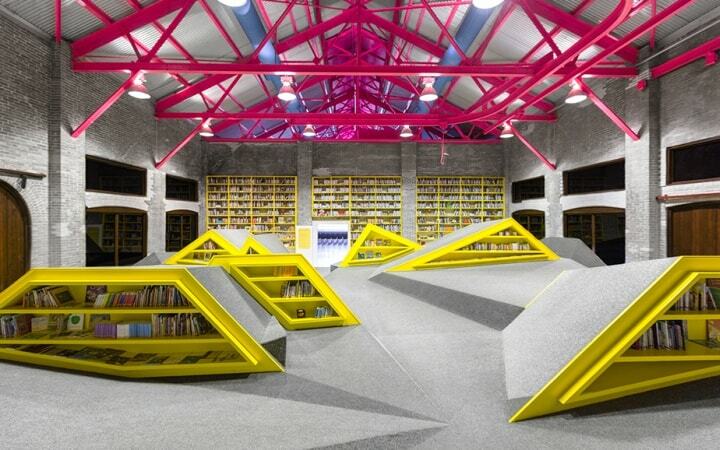 Inside of Niños Conarte, the book shelves and floor of the library are asymmetrical and geometrically multi-purpose, in the shapes of the mountains surrounding the city of Monterrey. The colors are cheerful and the space is meant to be a fun place to ignite a child’s imagination while they play and read. Also contained within the walls of the Niños Conarte is a cultural center and auditorium with unique lighting and colors to match the rest of the building’s architecture. The location of the area that the Ninos Conarte is, Fundidora Park, used to be the site of a massive steelworks location that was established in 1900. One of the most recognized buildings in the world, the Colosseum in Rome, Italy, is full of ancient Roman culture and traditions. 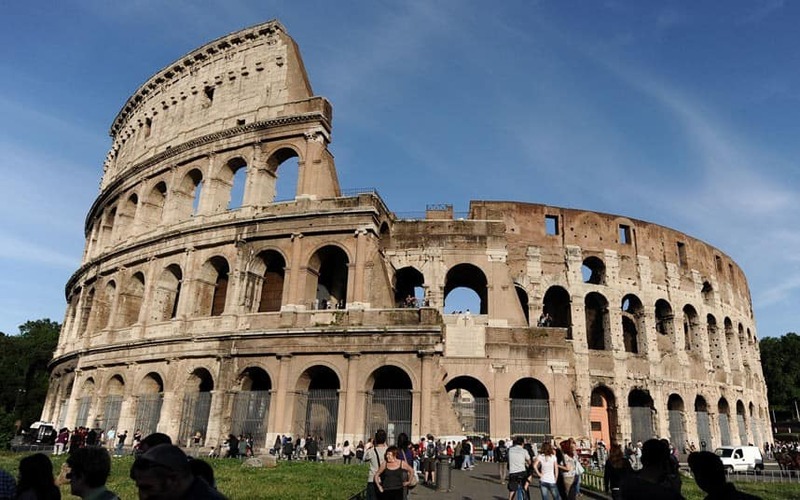 Commissioned in 70-72 A.D. by the Emperor Vespasian of the Flavian dynasty, the Colosseum was meant to be an amphitheater to host many forms of entertainment for the people of Rome that included games, animal fights, and brutal gladiator combats. The arena opened in 80 A.D. and began with 100 days of games and entertainment, which continued to be used for over four centuries. Archaeologists have found evidence of drinking fountains and bathrooms located within the Colosseum, which was an amazing architectural advance for the times. Afterward, through the 18th century, the Colosseum was used for building materials. Though the great arena has had over half of it’s architecture destroyed over time, the great Colosseum still stands and is a popular tourist destination that represents the rise and fall of the Roman Empire. The Gardens By The Bay in Singapore is one of the top ten gardens in the world. The gardens were built to eventually become the premier urban outdoor recreation space, as well as become a symbol of the nation of Singapore. Completed in 2012, Gardens By The Bay consist of three large parts; the central garden, the east garden, and the west garden. The gardens have two conservatories, the Flower Dome and the Cloud Forest. 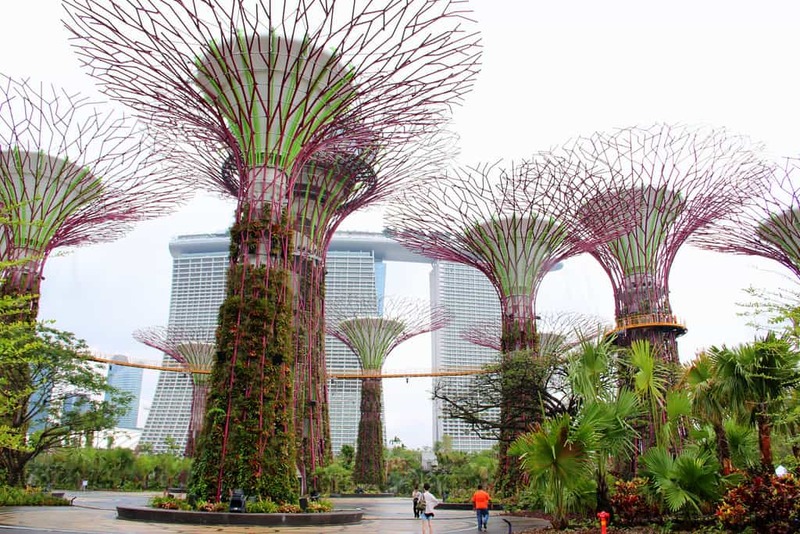 The most dominant feature of the Gardens By The Bay would be the Supertrees Grove. The large, tree-like structures stand between 25-50 meters in height, and also function as vertical gardens to help provide shelter and shading to other plants. The Supertrees contain environmental technologies that mimic the ecological function of trees. Solar energy panels help provide the Supertrees with energy to light the area and collect rainwater for the gardens. There is also a children’s garden with a tree house and adventure trail. The 87-floor skyscraper in London, called The Shard, is part of the London Bridge Quarter in the district. Also known as the Shard of Glass or Shard London Bridge, The Shard is currently the largest building in the European Union at approximately 1,014 feet high. The pyramidal tower consists of 72 floors for living, with a viewing gallery and open air observatory on the 72nd floor. 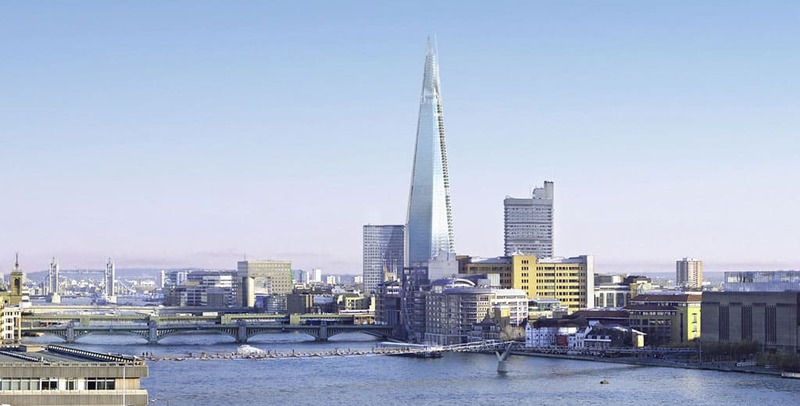 The architect who designed The Shard, Renzo Piano, wanted the structure to look like it was emerging from the Thames. The Shard got it’s name after the original design received criticism from the English Heritage, who said that the building would look like a shard of glass was being pushed through the heart of London. However, Piano retorted that the design for The Shard resembled the steeples of the churches scattered about London. The Shard is also powered by natural gas from the National Grid, with a combined heat and power plant. 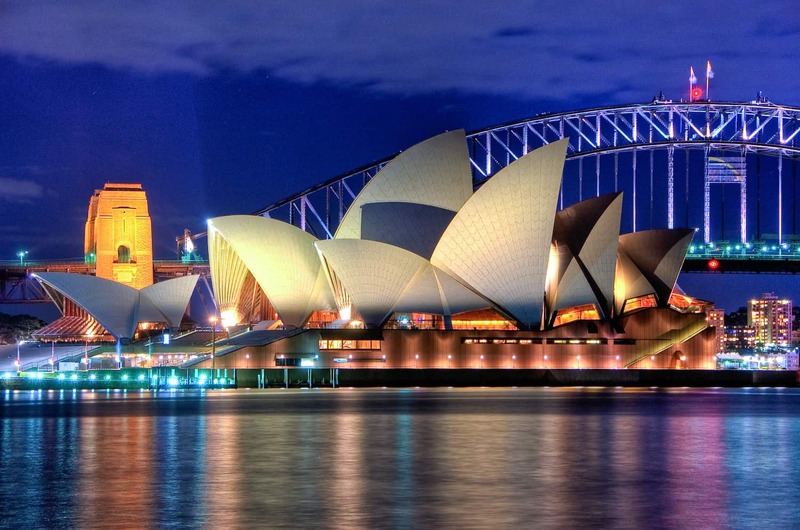 Located in Sydney Harbour, close to the Sydney Harbour Bridge, the Sydney Opera house is a stunning performing arts center that opened in 1973. The Sydney Opera House was designed by Danish architect Jorn Utzon, who won the international design competition in 1955 for the venue. He visited Sydney in 1957 to help supervise the construction and then moved his office to Sydney in 1963. Sydney Opera House was completed in three stages, and was to consist of not only an opera house but to serve as a multifunctional venue for the performing arts. Declared a UNESCO World Heritage Site in 2007, the Sydney Opera House hosts over 1500 performances per year, with an average attendance of over one million people per year. Several changes were made to Utzon’s design, giving way to the current structure it is today. Utzon’s original design for the Sydney Opera House was widely admired, though many things had to be changed about the design. The Petronas Towers are twin skyscrapers in downtown Kuala Lumpur that are a landmark of Kuala Lumpur, and remain the tallest twin towers in the world, replacing the World Trade Center in New York. The towers are considered a postmodern style that was designed by Argentine American architect Cesar Pelli. Construction was completed in March of 1996, and functions as a place for commercial offices as well as a tourist attraction. 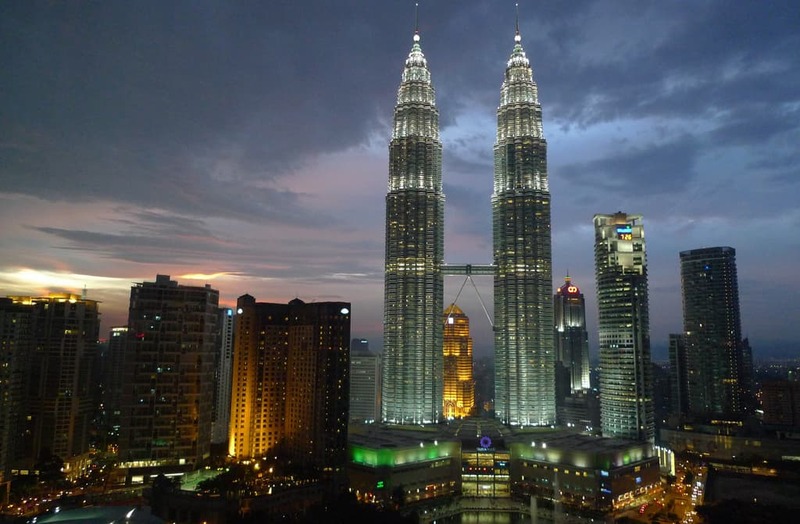 The height of the towers are 451.9 meters and were built on the site of the Kuala Lumpur race track. The towers have steel and glass facades that are meant to resemble Islamic art, in tribute to the Muslim religion of Malaysia. In 2009, the French urban climber Alain “Spiderman” Robert decided to climb up to the top of Tower Two, only using his bare hands and feet, and without any safety devices. He had made two attempts beforehand, getting caught and arrested both times. The One World Trade Center, located in New York City, is the replacement building for the World Trade Centers that were destroyed in the terrorist attacks against the United States on September 11, 2001. 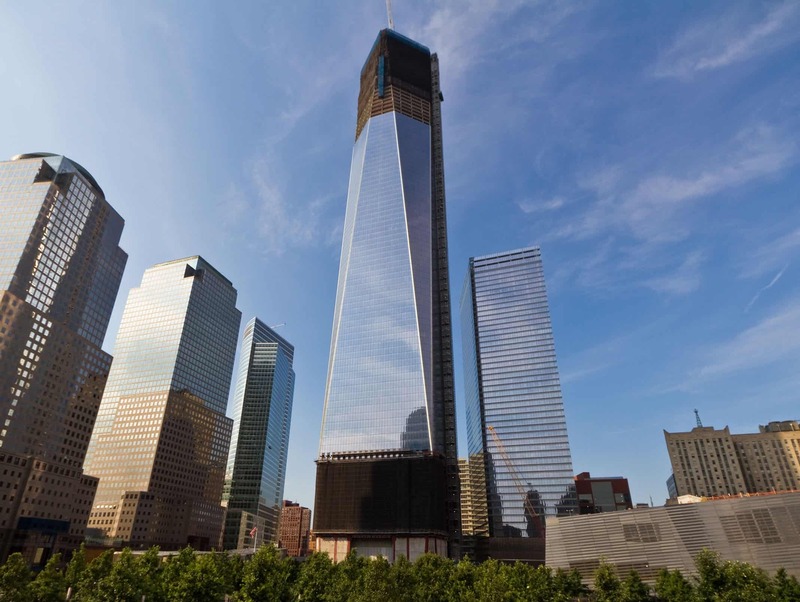 Standing at 1776 feet, the One World Trade Center is the United States’ tallest building. The massive office space also includes an observation deck and world-class restaurants. The One World Trade Center features an energy efficient design that uses renewable energy, reuse of rainwater, recycled construction materials, and interior daylight. The One World Trade Center also features improved safety systems that exceeds the current building code requirements for the city of New York, and it also features retail spaces in the lower levels. The One World Trade Center opened it’s doors in November 2014, and serves as a landmark for New York City, as well as a symbol of hope and peace for the people of the United States. The Guangzhou Opera House, located in Guangzhou, China, is a massive and beautiful performing center and is considered one of the biggest theaters in the nation. Opened in May of 2010, the opera house was designed by Iraqi architect Zaha Hadid, the first female to win the Pritzker Architecture Prize, took about five years to build. It is a freestanding structure composed of granite and glass-clad steel frames. The Guangzhou Opera House also served as inspiration for the fashion designer Vivienne Tam in her Fall 2010 collection. 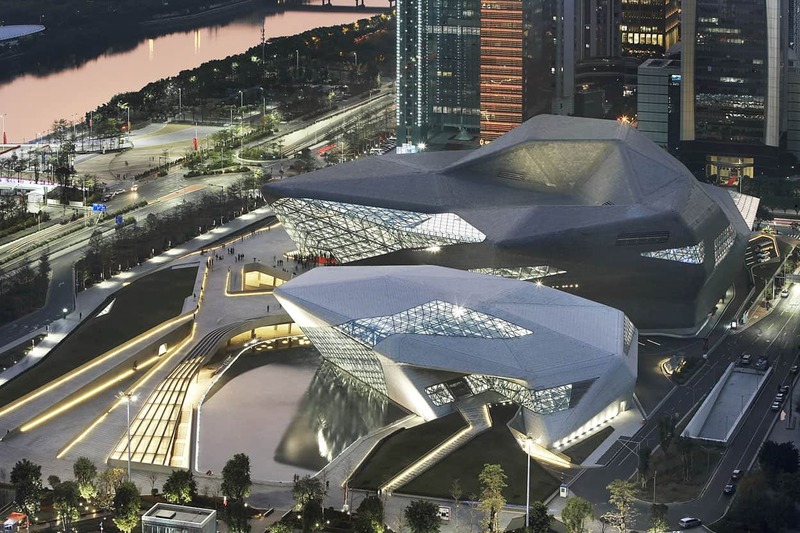 Overlooking the Pearl River, the Guangzhou Opera House is a state of the art monument that has open access to the riverside and docks, as well as a metro station that stops at the opera house. Rated as one of the top ten best opera houses in the world, the Guangzhou Opera house also features many operas and theater performances throughout the year. The Metropol Parasol is located in the old quarter of Seville, Spain at La Encarnacion square. Completed in 2011, the Metropol Parasol is the largest wooden structure in the world, standing at approximately 26 meters in height and 150 by 70 meters in length and width. 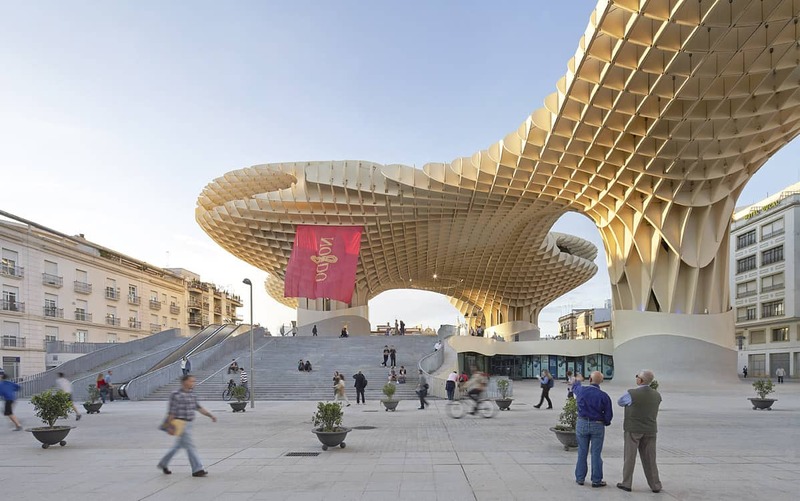 The building is in the form of six giant mushrooms, which are inspired by the vaults of the Cathedral of Seville as well as the nearby ficus trees. The Metropol Parasol consists of four levels, and features of the building include panoramic views and sidewalks at the top of the structure, a restaurant, public events, open air public plaza, and a museum that contains remains of the Roman and Moorish cultures. The construction of the Metropol Parasol was temporarily halted in 2007 due to problems with the materials being used that caused limitations. Using birch tree wood imported from Finland, the design was revamped in order to use glue as a reinforcement on the structure so the building could be finished. The overall cost of building the Metropol Parasol was around 100 million euros. 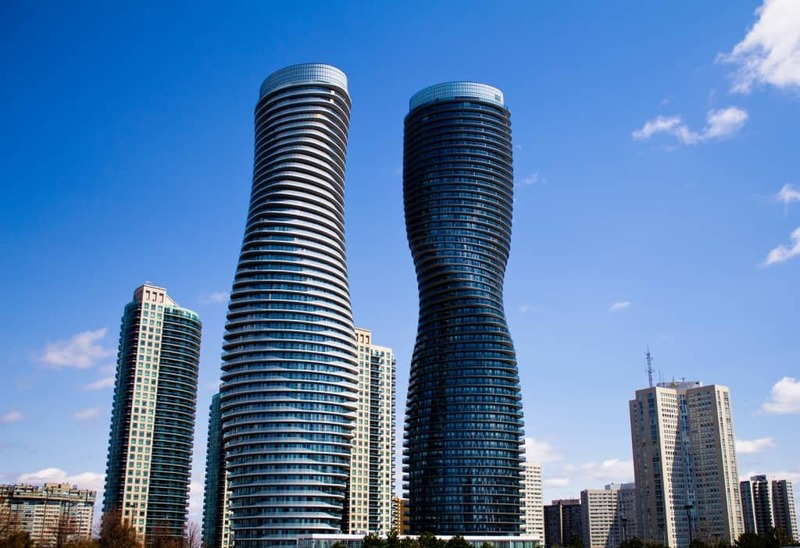 The twin tower residential condominium located in Mississauga, Ontario known as the Absolute World, the buildings look as if they are in a rotation shape and were built between 2010-2012. The Absolute World twin towers are a part of a five tower complex, with the twin towers being Absolute Tower Four and Five. The twin towers stand at 50 storeys and 56 storeys tall. The towers are owned by Fernbrook Homes and were created by Cityzen Development Group. An international design competition was announced during the 24th annual Mississauga Urban Design Awards ceremony in which the fourth tower for the Absolute World was going to be created. Architects from over seventy countries participated and submitted designs for the competition. The six finalists were announced in January of 2007, who were from Canada, United Kingdom, Mexico, and China. Each finalist prepared a final submission and the public voted for the favorite design. The winner was announced in March of 2007, who was Yansong Ma, the founder of MAD office from China. The Leaning Tower of Pisa, also known as the bell tower or campanile, is one of the most remarkable structures from medieval Europe. The Tower of Pisa was built to stand vertically, though it began to lean during construction due to an uneven foundation on soft ground, and stands at close to 60 meters tall. Being one of the four buildings that make up the cathedral complex in Pisa, Italy. The Tower of Pisa was the piazza’s crown jewel. The tower has about 207 columns around eight storeys, with construction that began in August of 1173. Construction of the Leaning Tower of Pisa continued for two hundred years due to numerous wars that took place during the time period. 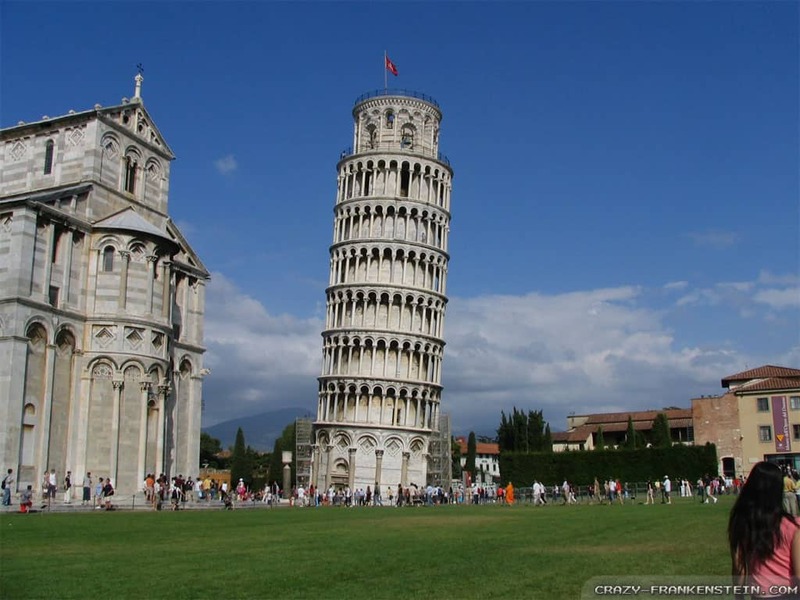 The architect responsible for the design of the Tower of Pisa is unknown. It was designed as a circular bell tower and is made of white marble. The Leaning Tower of Pisa was declared a UNESCO World Heritage Site in 1987, along with the other three structures within the Piazza. Located in the Red Square in Moscow, Russia, Saint Basil’s Cathedral is a colorful cathedral that was completed in 1561 on orders from Ivan the Terrible, meant to commemorate that capture of Kazan and Astrakhan. It was the largest structure in the city until the Ivan the Great Bell Tower was completed in 1600. Now known as a museum, the cathedral is also known as the Cathedral of the Intercession of the Most Holy Theotokos on the Moat. The cathedral originally consisted of eight churches arranged around the ninth church which was the central one. 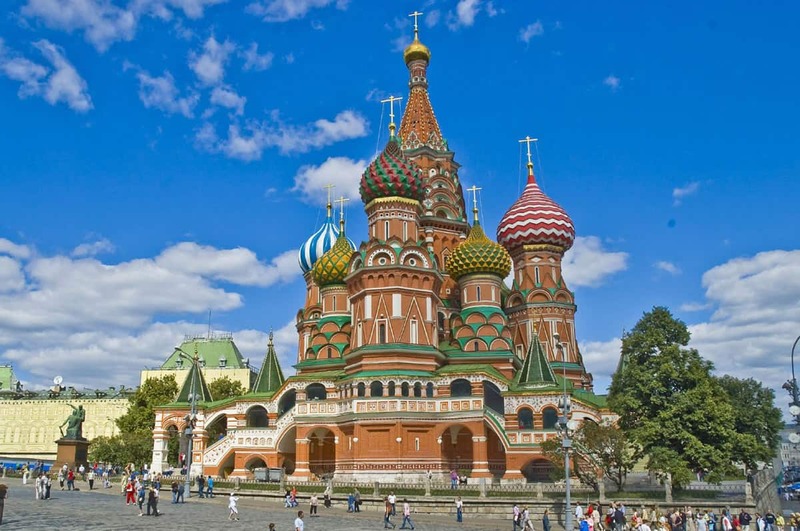 The tenth church was built over the grave of Saint Basil in 1588. It was called Jerusalem by many and was an allegory to the Jerusalem Temple in the Palm Sunday parades. The building is meant to be shaped like a bonfire reaching toward the sky, and is unlike any other building in Russia. The Hagia Sophia located in Istanbul, Turkey is a former Greek church that was built from the years of 537 through 1453. It was an Eastern Orthodox cathedral, then later became an imperial mosque, until it became the museum it is known as today. Briefly during construction during the time period of 1204-1261, it was converted into a Roman Catholic cathedral during the Latin Empire. The famous dome of the Hagia Sophia demonstrates the epitome of Byzantine architecture, which changed the history of architecture in the area. The Hagia Sophia was full of holy relics and a 49 foot silver iconostasis, and was also the focal point of the Eastern Orthodox church for almost one thousand years. When Constantinople was conquered by the Ottoman Turks in 1453, the church was converted into a mosque, until it was then converted into a museum in 1935. 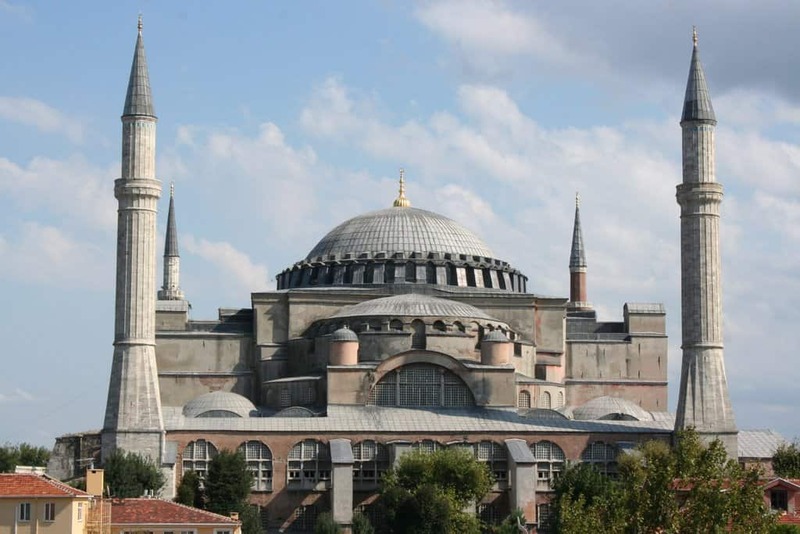 Byzantine as well as Islamic influences can be found within the structure of the Hagia Sophia. A museum of modern and contemporary art, the Guggenheim Museum Bilbao is a beautiful building located along the Nervion River in downtown Bilbao, Spain. The Guggenheim Museum was named one of the most important works completed since 1980 in the World Architecture Survey. The museum was built and opened in 1997, in what used to be a decrepit area along the river in downtown Bilbao, in hopes of being able to improve the surrounding area. The outside of the museum consists of limestone, glass, and titanium, giving it an impressive look from the river. It has more exhibition space than the three Guggenheim collections in New York and Venice. 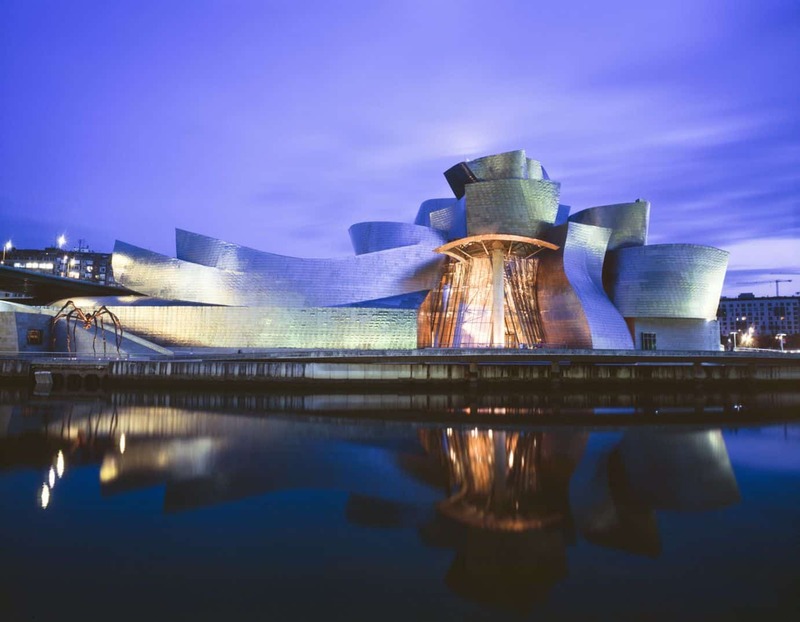 The Guggenheim Museum of Bilbao is best known for housing the largest, site specific work of contemporary artists and also features work from Basque artists. When the museum opened in 1997, it featured a 300 piece overview dedicated to the Cubism movement. Exhibitions at the Guggenheim Museum are changed often, and brought in over 4 million tourists during the first three years. Sweden’s Turning Torso is the tallest skyscraper in Sweden as well as all of Scandinavia. The Absolute World residential towers in Ontario took similar inspiration from the Turning Torso. Since it is a private residential building, public access is not allowed. The tower reaches 190 meters in height and consists of 147 apartments, as well as amenities such as a gym, lounge, spa, and wine cellar. The Turning Torso was designed by Spanish architect Santiago Calatrava and opened in August of 2005. The design of the Turning Torso was based on a sculpture of a twisting human being created by Santiago Calatrava called the Twisting Torso. 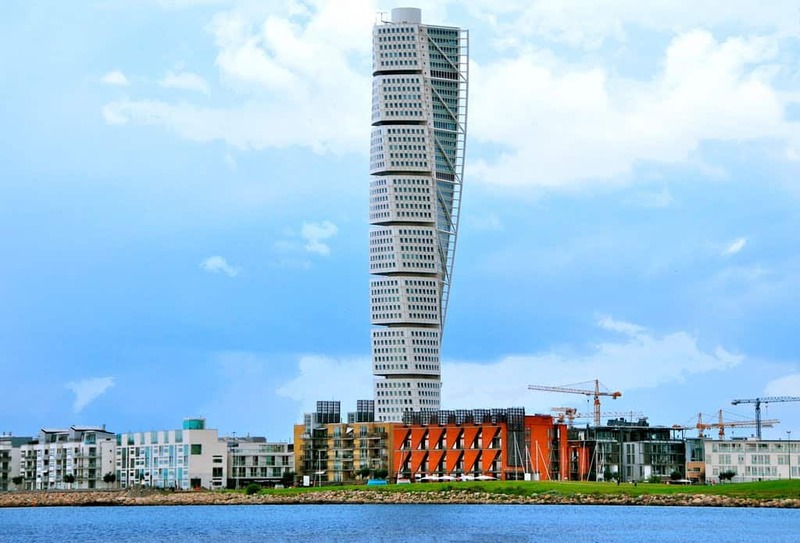 One of the reasons for building the Turning Torso was to give the city of Malmo a recognizable skyline since the removal of the Kockums Crane had changed the city’s original skyline. Part of the construction of the building was document on Discovery Channel’s “Extreme Engineering” television show.